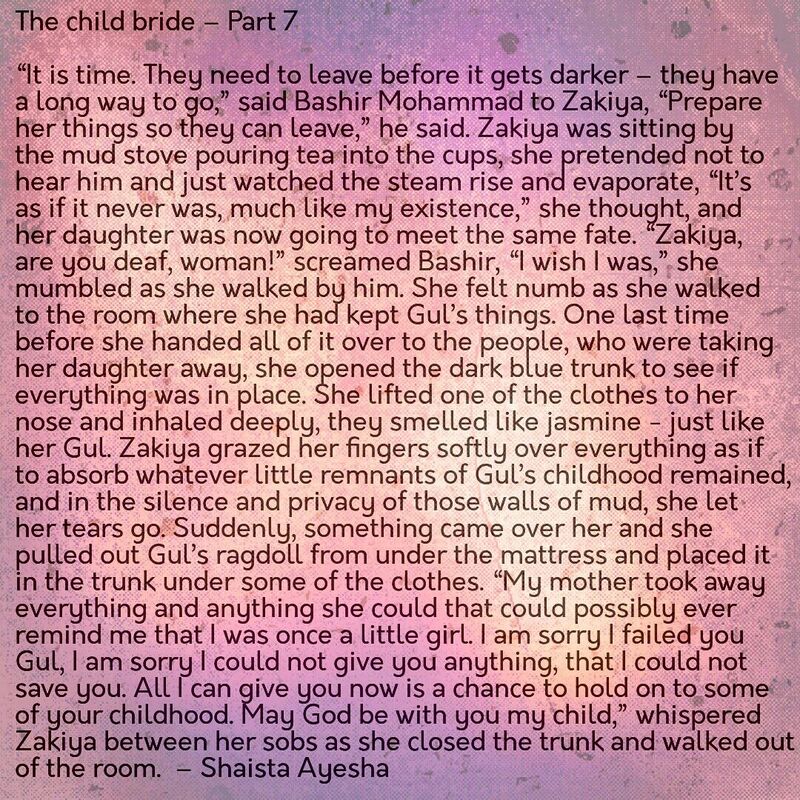 On the United Nations International Day of the Girl Child in October 2017, Pakistan’s Senate rejected a bill that would have risen the minimum age for girls to marry from 16 to 18, stating that the proposed amendment was “contrary to religious injunctions”. 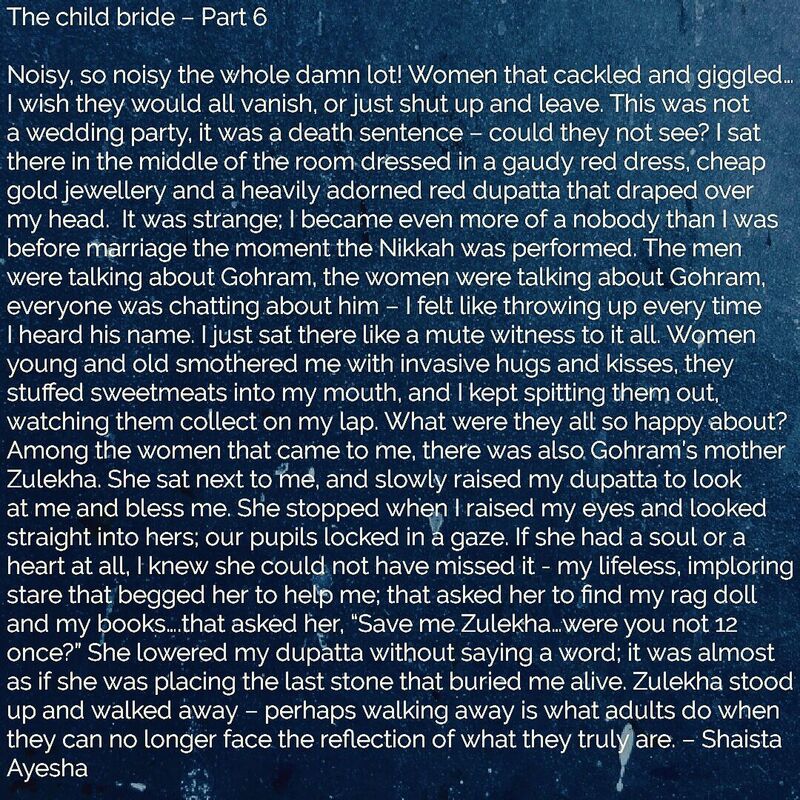 The current law in Pakistan states the legal age of marriage is 16 for girls and 18 for boys, but even this law isn’t considered, as the Pakistani courts follow Sharia (Islamic law) which allows any girl who has gone through puberty to marry. The consequences of marriage and pregnancy in childhood could lead to death! Pakistan’s Maternal Mortality Ratio (MMR) still stands at 276 per 100,000 live births and Pakistan’s newborn mortality rate is at 55 per 1,000 live births, these high rates of maternal and child mortality are due to early marriages. Pakistan has hence failed to achieve its Millennium Development Goals (MDGs) target for maternal and child health. According to a UNICEF estimate, 3 percent of girls in Pakistan are married before they turn 15 and 21 percent before age 18. People who are involved in an under-age marriage are punished by one month in prison along with a PKR 1,000 fine ($10). The reason behind such practices is poverty, lack of education, and cultural values. Raising awareness about the issue should be everyone’s job. 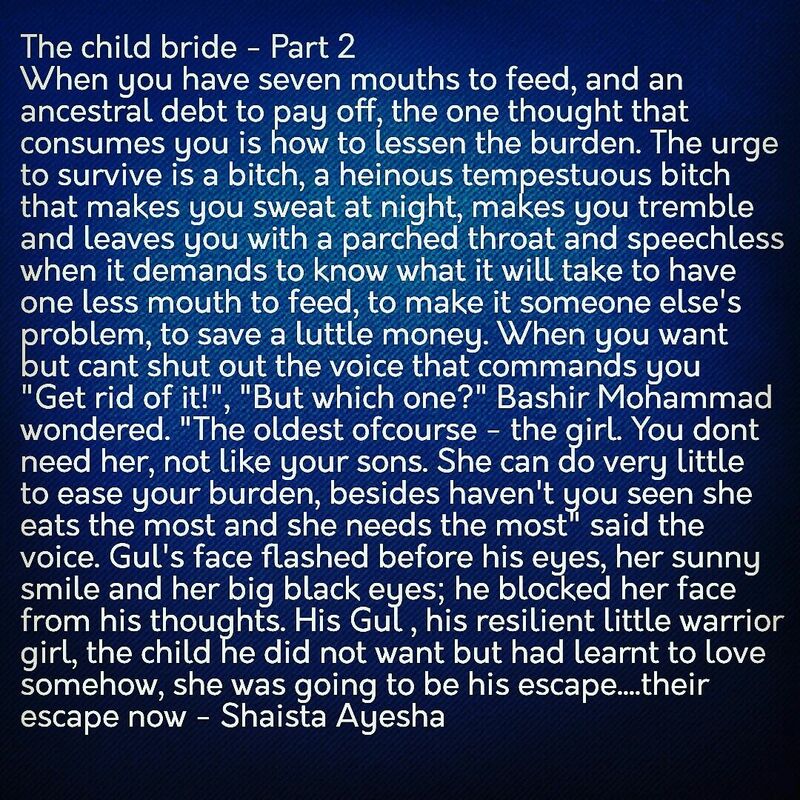 This writer from Karachi is trying her bit to spread as much awareness on the topic, through the art of storytelling. 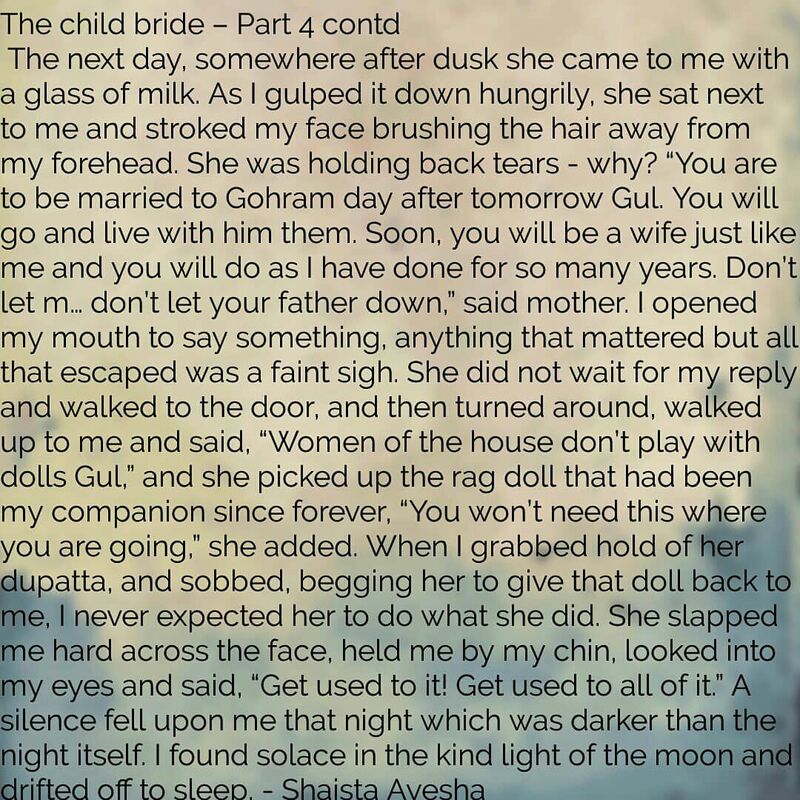 Her story, which she has been sharing on her facebook in form of a series tells the heartbreaking tale of a girl who is married of at the tender age to a man much older than her. 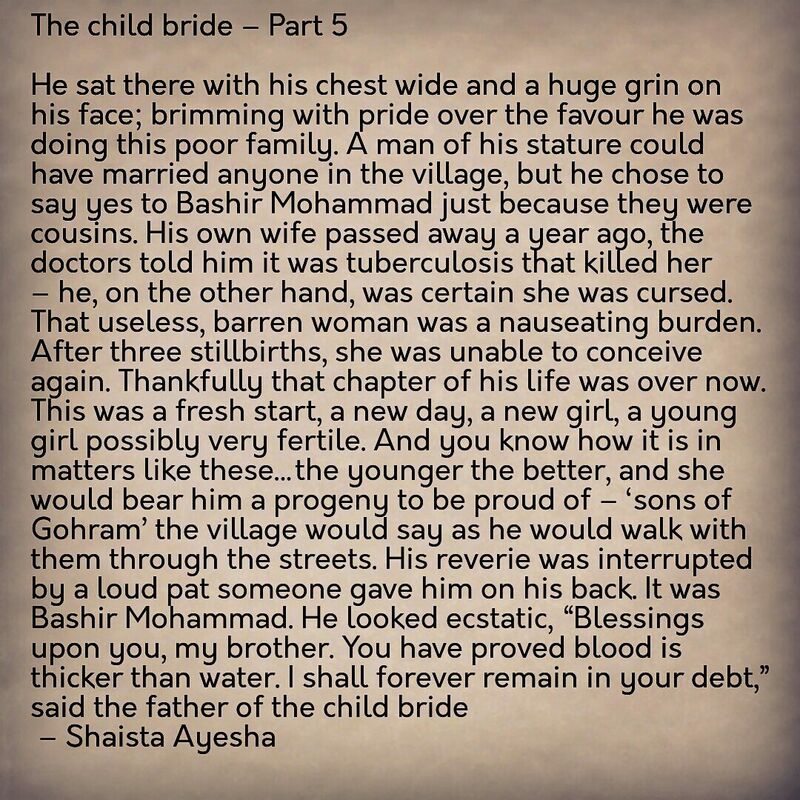 Her plight well unfolds as you read through the heart-wrenching story. 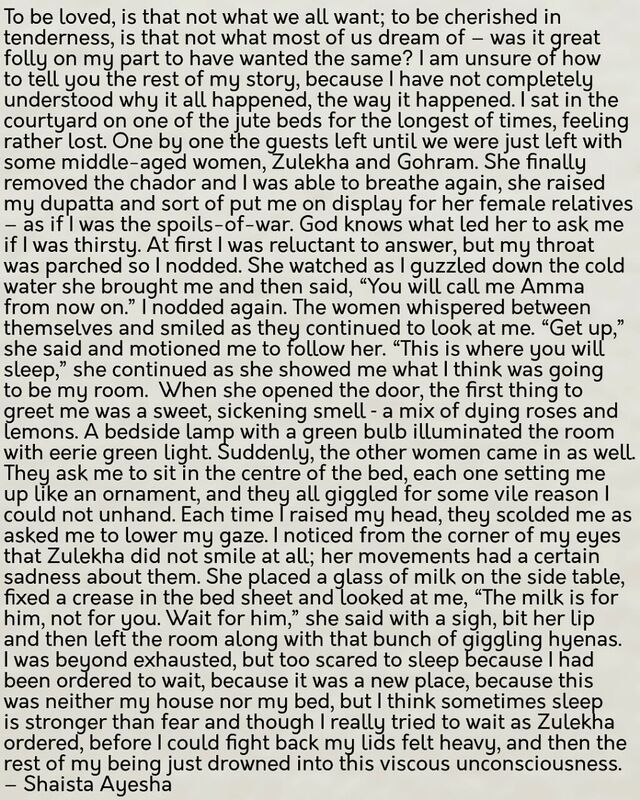 Following are the parts of her story. 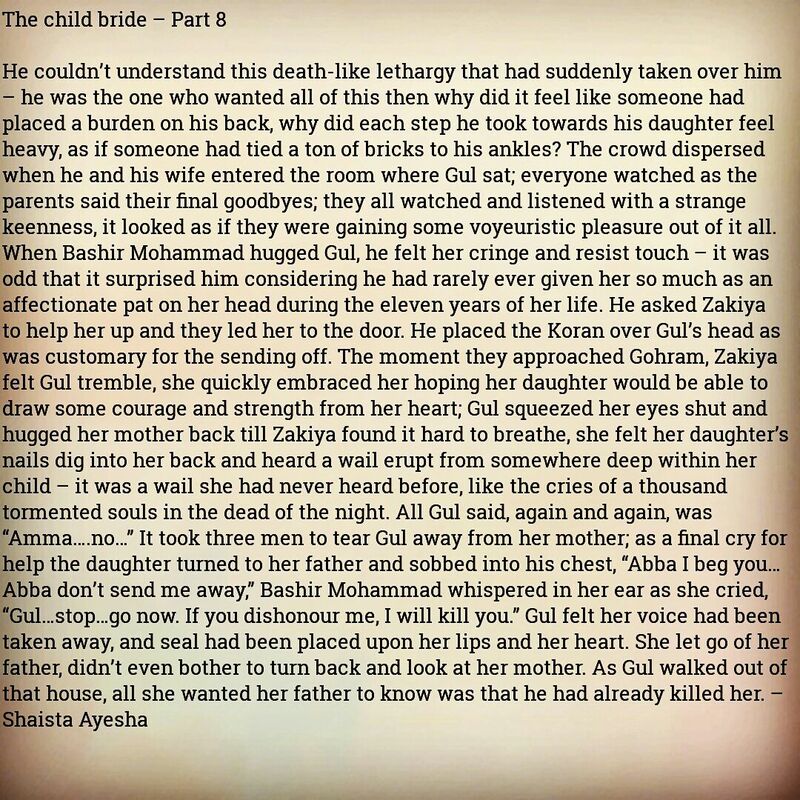 The story of Gul is truly captivating, her father thinks he is getting rid of a burden. Her mother knows she has sentenced her child to death. 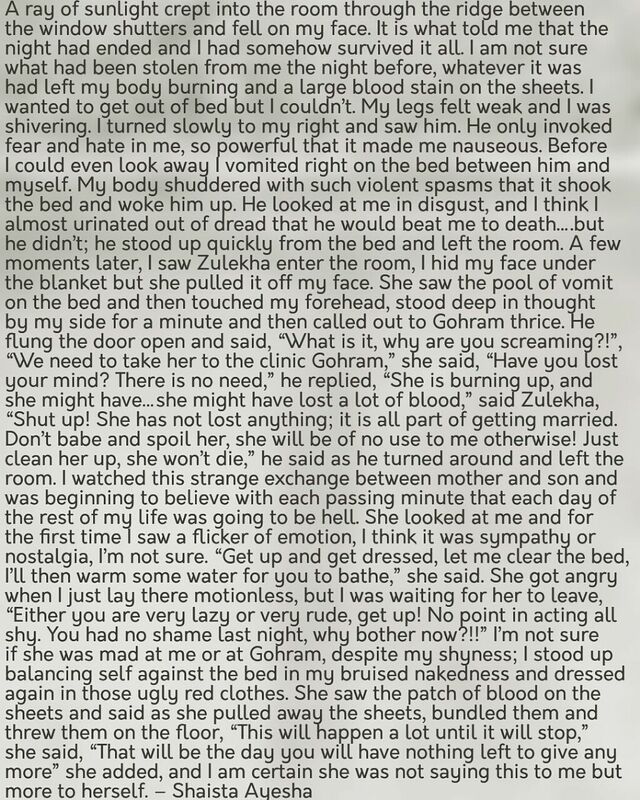 Gohram, her husband, thinks it is his right to torture her, Zulekha is as helpless as Gul. What will happen to Gul now? Will she die? Why did she vomit? Why doesn’t Gorham understand that she is sick and needs help? We will only learn as the story unfolds…. we will be waiting for this. 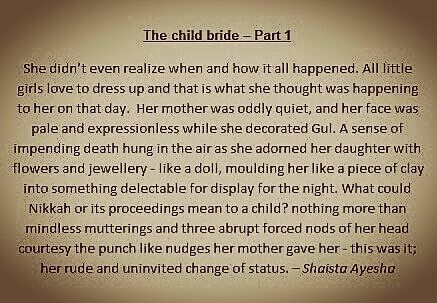 Child marriage is real, it is not a myth and it happens more frequently then we realize around us. 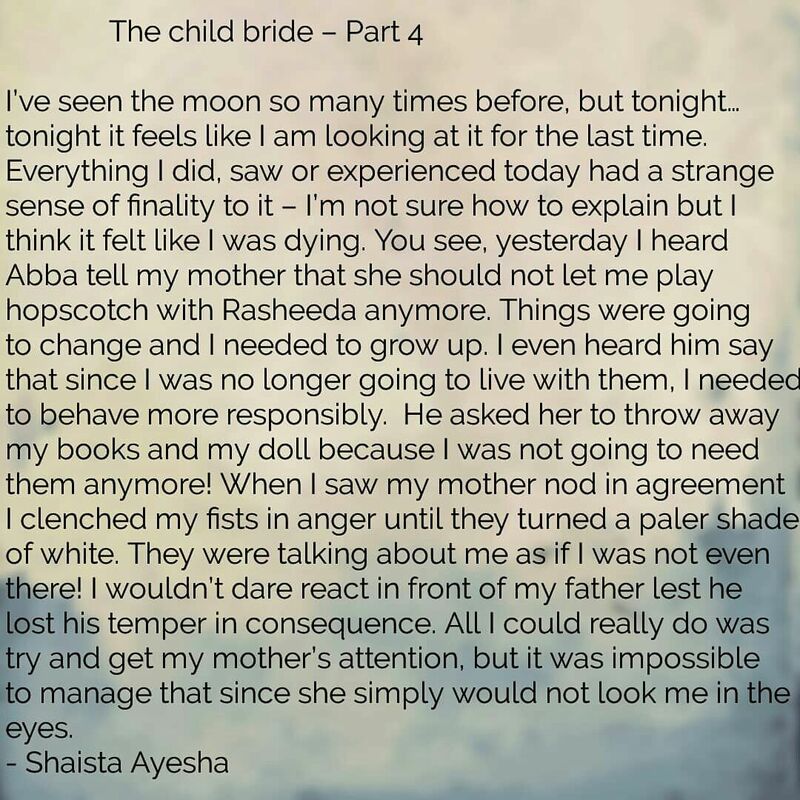 Shaista Ayesha, the writer of ‘Child Bride’ has given Parhlo permission to publish her work.